Like everything else, festivals are also big and colourful in India. With at least 4 religions of significance, it often feels like there’s a celebration every month. I love how people of different religions come together at festival time to celebrate each other’s traditions, and food is always a big part of that celebration. Culture, religion, geography and yes, even the weather influence the cuisine across India. 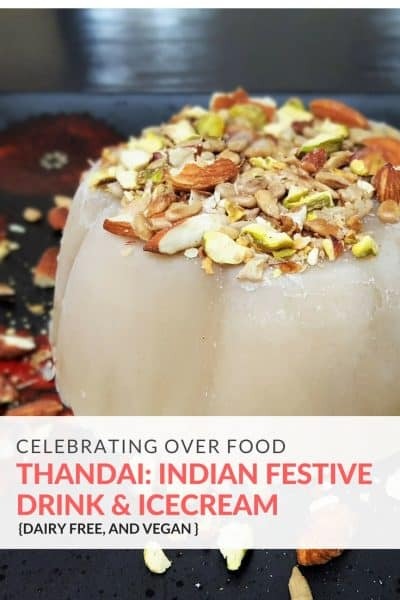 Thandai is a perfect example – cold and refreshing spiced milk that is served on special festival days like Holi and Diwali in Northern India. Traditionally it is made with whole milk, brewed with a combination of spices, nuts and bhaang. You’ll never guess what the last is – cannabis in liquid form! This Thandai recipe is more kid-friendly, and dairy-free because if I’m making something delicious I want my entire family to be able to enjoy it. The colourful festival of Holi usually falls at the beginning of spring when flowers are starting to bloom and the grass is turning green once again. 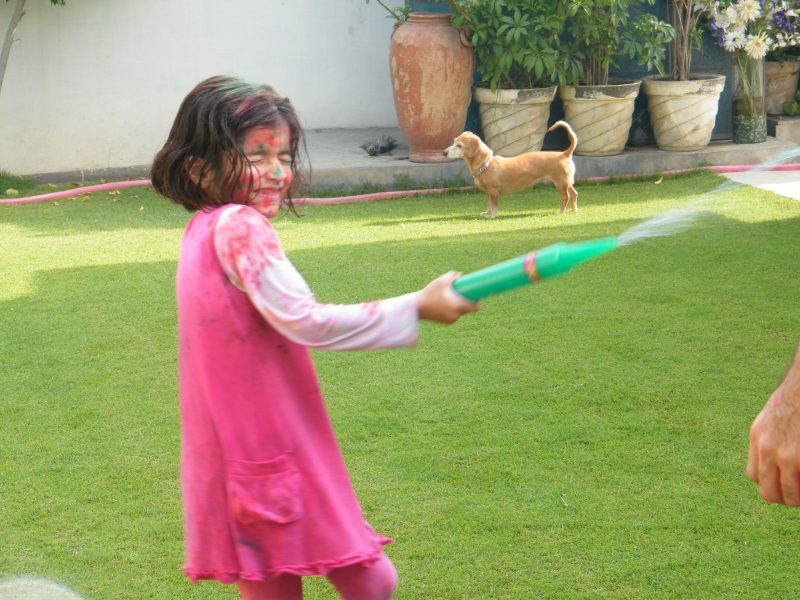 This festival is celebrated with coloured powder and coloured water and very messy clothes. The day usually ends with yummy food and drink. My youngest is dairy-free and my hubby is lactose sensitive and so I’m constantly looking for alternatives to regular milk in traditional Indian recipes. This is one of them and I was delighted it turned out delicious. Not all my experiments do! 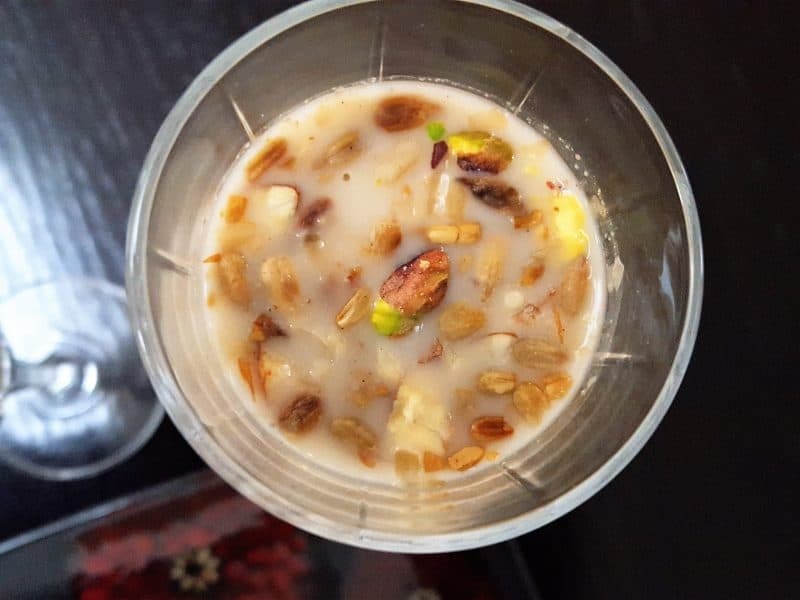 Replacing whole milk with almond milk also makes this chilled Thandai drink lighter in calories, higher in Vitamin E and overall a good source of Calcium. You can of course switch the almond milk out for regular whole or 2% milk. As I was testing this recipe in my kitchen I knew I had to make it kid-friendly. Knowing my kids’ penchant for ice cream, I thought that would be a good option. 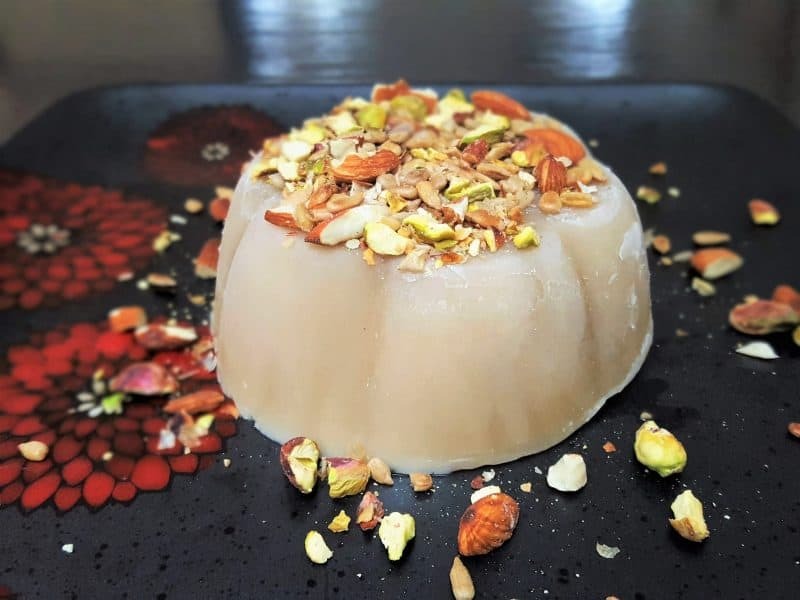 Almond milk ice cream works really well, in a kulfi-like way. A little more crystalline than regular milk but oh so refreshing! After all Holi hai! Heat almond milk along with all the spices except for the saffron. As soon as it starts to boil, turn the heat to medium and let it simmer for 20 minutes. Add saffron and let the colour steep and the flavours infuse. Simmer another few minutes. Take this time to roast the nuts and seeds in a pan. Med-Low heat is best for this since the sunflower seeds will burn. Let them cool. With a rolling pin, coarsely crush the nutty mixture. You can use a strong quality Ziplock bag or aluminium foil to hold the mixture together. Divide the Thandai milk in two parts. Make ice cream with one half. I used a flower shaped silicone mould to get the pretty shape, and I was able to pop the ice cream out. Serve it with crushed nuts and seeds. Chill the remaining milk overnight. When you’re ready to serve, sieve into pretty glasses and top with the nutty mixture.